Today (Saturday) was the opening day of the first Baku Grand Slam as the Azerbaijan capital hosted the second Grand Slam of the year at the “Sarhadchi” Sport Olympic Centre. 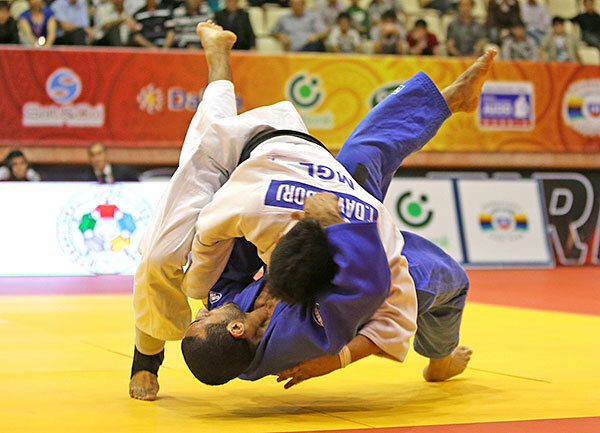 In an ever-evolving city where sport is an integral part of society, the judo events have advanced at the same rate as the Azerbaijan Judo Federation staged the annual World Masters and Grand Prix events in recent years before securing one of the four marquee Grand Slam events this year. Seven weight categories were in action as the women’s -48kg, -52kg, -57kg and -63kg categories and men’s -60kg, -66kg, -73kg categories competed. 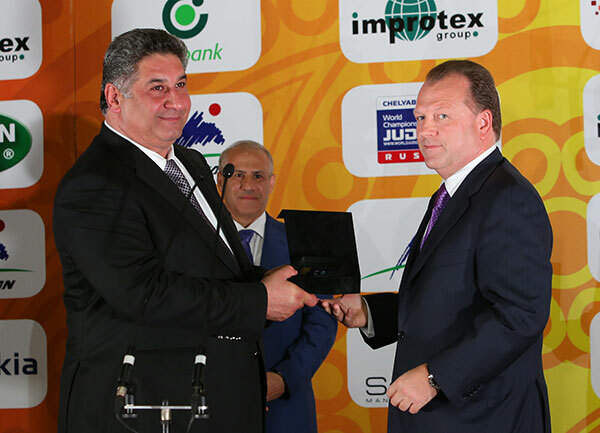 During the opening ceremony of the event Mr. Marius VIZER, the IJF President, said: “Mr. Minister of Sport, Mr. President of the Azerbaijan Judo Federation, guests, spectators and judoka, on behalf of the International Judo Federation, I want to congratulate your country for the very high achievement on social, economic, sport and education. Mr. Fizouli ALAKBAROV, Azerbaijan Judo Federation President, said: “Dear guests and sport fans I have the pleasure to welcome you to a great tournament. As we honour our national leader, Heydar ALIYEV on his 90th anniversary we recognise how much he did for us and how his work carried on by current President Ilham Aliyev. Mr. Azad RAHIMOV, Minister of Youth and Sports of Azerbaijan, said: “Dear friends, dear guests, I’m glad to see you in Baku for the event in honour of Heydar ALIYEV. 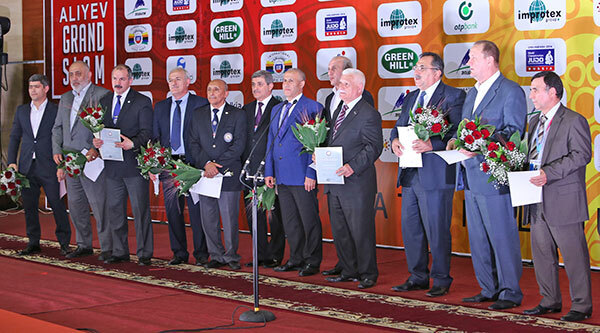 Before the final block there was a 5th dan grade presentation to a number of figures by the Azerbaijan Judo Federation. The promotion was awarded to Farhad Racabli, Gudrat Pancaliyev, Ahmeddin Racabli, Tarlan Hasanov, Sahib Ismayilov and Ramin Mahmudov. They were joined on stage by Zakir Kerimov, Asif Yusifov, Sergey Seleznov, Valeh Maharramov, Ismet Isgandarov and Elxan Racabli who also received the same honour. Ebru SAHIN (TUR) starred in the -48kg category as the European bronze medallist outfought former Abu Dhabi Grand Prix bronze medallist Otgontsetseg GALBADRAKH (MGL) to win by ippon. 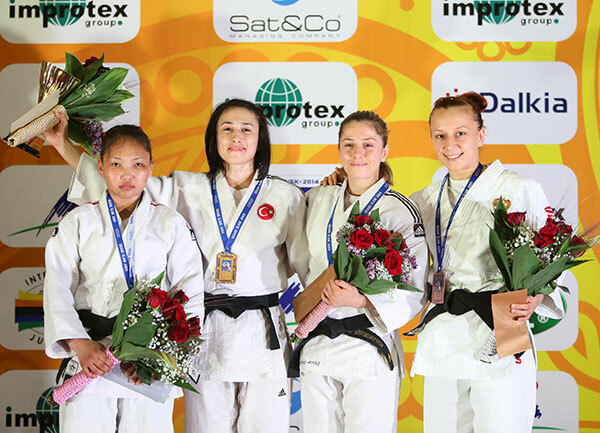 Turkish prodigy SAHIN sealed a place in the final by conquering Rada BIKTIMIROVA (RUS) in the semi-fina while GALBADRAKH defeated Samsun Grand Prix bronze medallist Sumeyye AKKUS (TUR) by a waza-ari score. The first bronze medal was won by Rada BIKTIMIROVA (RUS) who ended the medal hopes of Maryna KROT (UKR) by a solitary yuko. The second bronze medal was captured by Sumeyye AKKUS (TUR) who downed Tetyana DZHABRAILOVA (UKR) also by a yuko. Jaana SUNDBERG (FIN) was crowned Baku Grand Slam gold medallist as she grinded out a hard-fought victory over the resolute Tsolmon ADIYASAMBUU (MGL). SUNDBERG booked her place in the final by seeing off the challenge of Oleksandra STARKOVA (UKR) while ADIYASAMBUU edged past Gili COHEN (ISR) by a waza-ari. The first bronze medal was clinched by Oleksandra STARKOVA (UKR) who bested Ayse ARCA (TUR) in the opening minute by ippon. 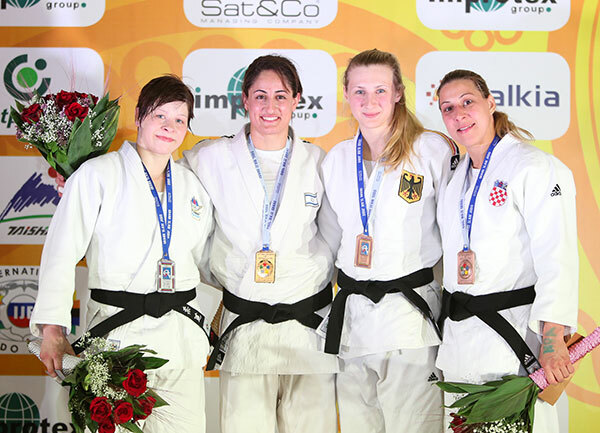 The second bronze was won by world number 12 Mareen KRAEH (GER) who showed the greatest example of her talent when it mattered as she took bronze by ippon against Gili COHEN (ISR). 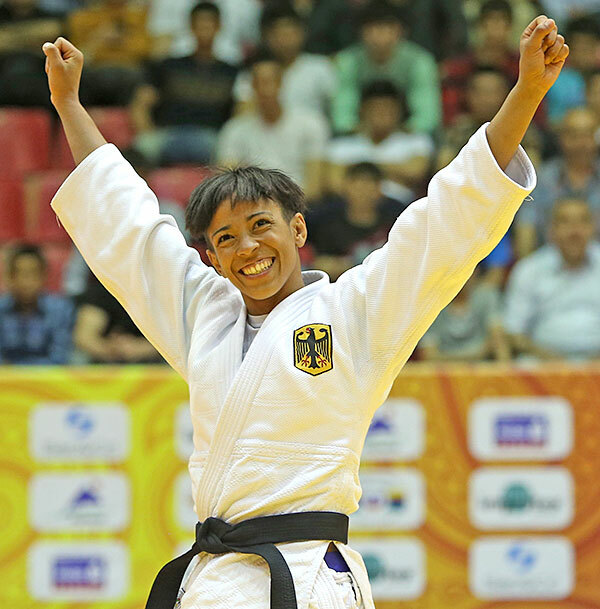 Former European bronze medallist Miryam ROPER (GER) won a career-best Grand Slam gold medal with a resounding win over former Pan-American bronze medallist Joliane MELANCON (CAN). ROPER, who returned from injury at the Samsun Grand Prix in March, showed she’s at the peak of her powers by catching MELANCON with a ko-uchi-gari in seven seconds for ippon. 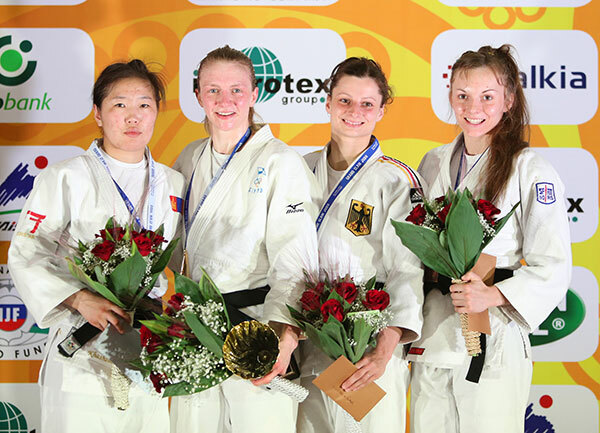 ROPER sealed a place in the final by defeating Sumiya DORJSUREN (MGL) by ippon while Joliane MELANCON (CAN) won through against ROPER’s fast-rising teammate Johanna MUELLER (GER) by ippon. The first bronze medal was awarded to Kifayat GASIMOVA (AZE) as the unfortunate world number 19 Johanna MUELLER (GER) was unable to compete due to injury. The second bronze medal was won by Sumiya DORJSUREN (MGL) after a stern challenge from Shahana HUSEYNOVA (AZE). The ever-improving Yarden GERBI (ISR) won -63kg to continue her meteoric rise on the World Judo Tour as she added to a her Dusseldorf Grand Prix bronze and Samsun Grand Prix silver medal. The world number six bested fellow 2013 European bronze medallist Tina TRSTENJAK (SLO) in a very competitive final as her fine run of form showed no sign of slowing down in Azerbaijan. GERBI looked full of confidence as she surged into the final by overcoming Anna BERNHOLM (SWE) by ippon in the semi-final. TRSTENJAK shaded Martyna TRAJDOS (GER) at the same stage by waza-ari. 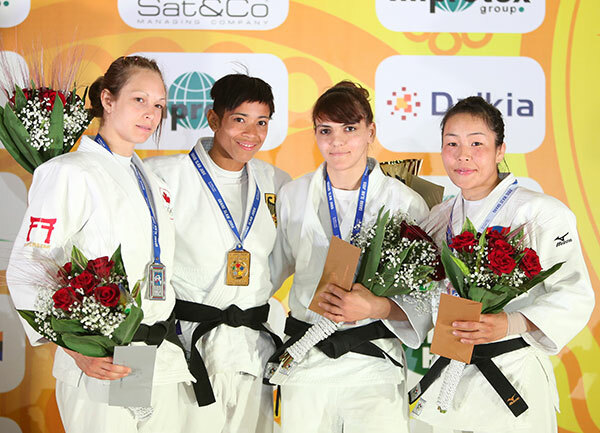 The first bronze medal was clinched by reigning Moscow Grand Slam silver medallist Martyna TRAJDOS (GER) who defeated former junior standout Andreja DAKOVIC (CRO) by ippon having opened the scoring with a yuko. The second bronze medal was awarded to Marijana MISKOVIC (CRO) who outworked Anna BERNHOLM (SWE) for the final spot on the medal podium. 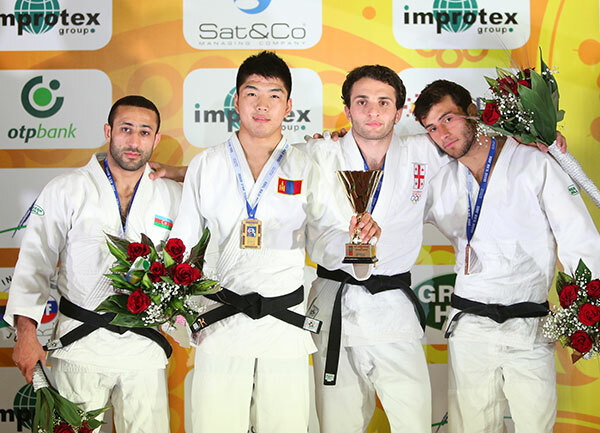 Samsun Grand Prix winner Amartuvshin DASHDAVAA (MGL) illustrated why he was the top seed as he won -60kg gold in Baku. World number 10 DASHDAVAAA fell behind in the final to Askhat TELMANOV (KAZ) but levelled with a waza-ari of his own before a second saw him capture the gold medal by waza-ari awasette ippon. DASHDAVAA overcome European bronze medallist Ashley MCKENZIE (GBR) in the semi-final while TELMANOV bested the highly-regarded Ahmet KABA (TUR) at the same stage. The first bronze medal was won by Pavel PETRIKOV (CZE) whose waza-ari score was enough to secure a place on the medal podium. The second bronze medal was clinched by Robert MSHVIDOBADZE (RUS) who won his first Grand Slam medal against in-form Ashley McKenzie (GBR) in a reverse result of the 2010 u23 European Championship final. Newly-crowned Asian champion Tumurkhuleg DAVAADORJ (MGL) shone as his precious talent glistened once more on the elite stage as he toppled Nijat SHIKHALIZADA (AZE) in the -66kg final. World number three DAVAADORJ secured a place in the final against a resilient Tristan PEIKRISHVILI (GEO) with three yuko scores in their semi-final contest. Nijat SHIKHALIZADA (AZE) also distinguished the gold medal aspirations of a Georgian judoka as he scored a waza-ari before winning by ippon at the same stage. 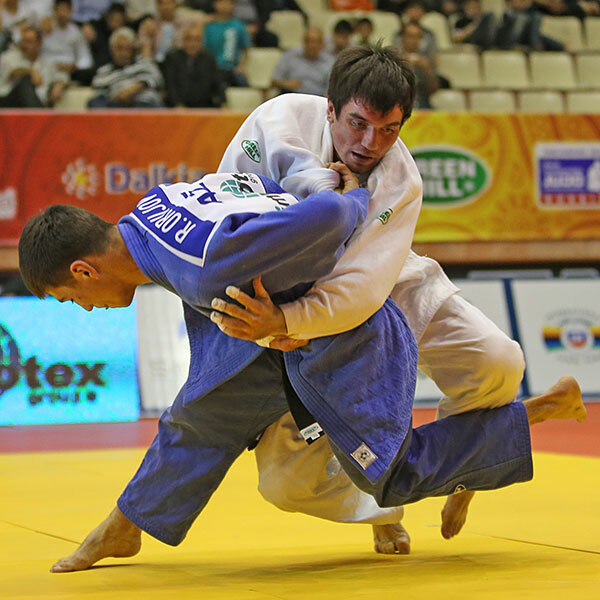 The first bronze medal was captured by Shalva KARDAVA (GEO) who thwarted Tarlan KARIMOV (AZE) by ippon. The second bronze was won by teenager and breakout star Tristan PEIKRISHVILI (GEO) who announced his arrival on the World Judo Tour in style. PEIKRISHVILI scored a waza-ari before capping a fine day by catching Yakub SHAMILOV (RUS) for ippon. Rustam ORUJOV lapped up the huge ovation from his compatriots in the crowd as he ensured Azerbaijan would be among the winners on day one. 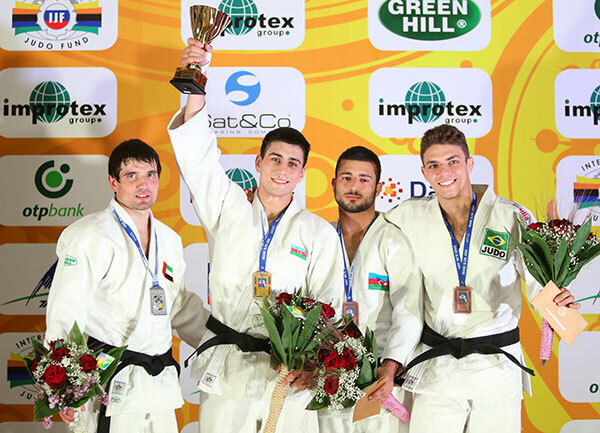 ORUJOV, who took gold at the Baku Grand Prix last year, took on Victor SCVORTOV (UAE) in the -73kg final and delivered an inspired performance as he registered a waza-ari which brought an end to SCVORTOV’s impressive run. SCVORTOV still had plenty to celebrate having won the United Arab Emirates’ first medal at this level. 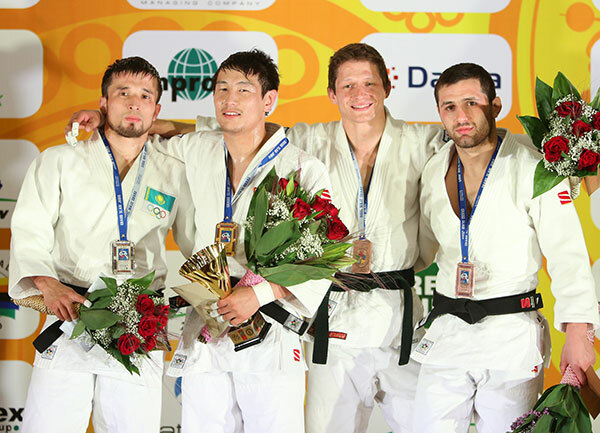 ORUOV booked a place in the gold medal contest by toppling crowd favourite Huseyn RAHIMLI (AZE) as SCVORTOV ended the gold-medal winning hopes of former Rio Grand Slam winner Marcelo CONTINI (BRA) at the same stage. The first bronze medal was won by Huseyn RAHIMLI (AZE) who brought the home crowd to their feet as he upset top seed and Pan-American champion Nicholas DELPOPOLO (USA) by coming back from being a waza-ari behind to throw for ippon. The second bronze medal was captured by Marcelo CONTINI (BRA) in scintillating fashion. The Brazilian trailed Zebeda REKHVIASHVILI (GEO) by a waza-ari but kept his cool to pick up the win by ippon with one second left on the clock.